Juan Hernandez lives in L.A. with his wife, Crystal, and young daughter, Sofia, and is their family’s sole provider. On September 25, 2017, Juan was at his job as a mechanic at View Park Automotive in Los Angeles, CA, where he’s worked for the past seven years. Suddenly, six Immigration and Customs Enforcement (ICE) agents stormed the shop with semi automatic weapons drawn. Despite only having a deportation order for the shop’s owner, the agents handcuffed everyone who worked there- including Juan. Agents arrested him with no probable cause, warrant, previous contact with or information about him. He was arrested based solely on the color of his skin, and detained for four weeks before his family and community were able to fundraise for his bail. The entire incident was captured from the shop’s interior and exterior surveillance cameras. Juan’s lawyers at the ACLU of Southern California, the Law Offices of Stacy Tolchin, and organizers at The National Day Laborer Organizing Network (NDLON), are using the footage to corroborate witness testimony, help expose how ICE’s actions violated their own regulations, and advocate for Juan and his family. According to the ACLU’s court filing, because ICE had neither a warrant or probable cause for arrest, the court should terminate deportation proceedings against him. Witnesses said ICE agents failed to identify themselves as immigration agents even though their regulations require them to as soon as it’s “practical and safe to do so” (see regulation:8 CFR 287.8(c)(2)(iii)). And as evidenced by the surveillance footage showing Juan and his colleagues calm and cooperating, ICE officers had no reason to feel unsafe. The question of their identities was made even more confusing by agents wearing vests that read “POLICE,” as can be seen in the surveillance footage. According to the court filing, it was only during the car ride to the immigration processing center that Juan finally learned who the agents were. The footage helps corroborate Juan and other witness testimony of how the raid occurred, and the way in which ICE agents approached people who they were not previously targeting with no explanation of who they were and why they were making arrests. In the exterior camera footage, can see an ICE agent order Juan to put his hands up and stand against a car, search and then handcuff him with no conversation, despite not having any reason to believe Juan was not a U.S. citizen. 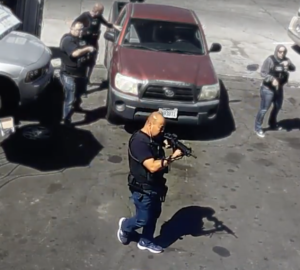 Perhaps the most shocking issue the surveillance video exposes is how six agents stormed a place of business in the middle of the day with semi automatic weapons drawn despite only having an order to detain one person, who wasn’t a violent criminal. In order to advocate for Juan and inform the public of the egregious ways ICE operates, Eva and her team have been employing creative strategies using the surveillance footage. Their multimedia producer edited a short video that highlights the different abuses visible in the footage, rendering it easier to digest for a wider and non-legal audience. 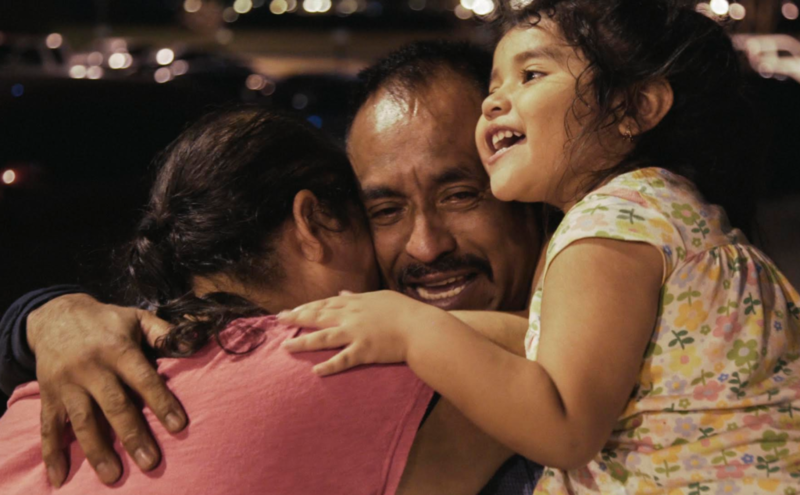 She also included interview footage of Juan, and footage WITNESS filmed of Juan, his wife, and daughter reuniting at the immigration detention center after his bail was paid. By editing the surveillance footage to clearly show the abuses and adding footage of Juan and his family, the ACLU is able to tell a more complete and human story that advocates for Juan outside of the courtroom as well. Surveillance video can be a great alternative to eyewitness video, which isn’t always safe or easy to capture and share in the moment – especially in immigration cases where keeping someone’s identity and immigration status secure can be crucial. As with Juan’s case, it can be helpful to look for surveillance cameras in the area after an incident with ICE. Eva was able to secure the footage from the mechanic shop by asking the wife of the owner, who was unfortunately deported. Remember that a lot of businesses delete surveillance footage at the end of the day or within the week – so get there soon and ask to speak with an owner or manager. Look for surveillance cameras in the surrounding area of the incident as well. If Eva and her team had been able to get to the 7/11 store near the mechanic shop sooner, they may have been able to secure another surveillance camera angle of the incident before it was deleted. If you edit the video, be sure to do so from a copy. Keep the original file unedited. Keep clear records of the video’s chain of custody, with detailed notes that document who collected the video, where was it stored, if it was edited or converted to a different file format, etc. Not documenting chain of custody could hurt your chances of authenticating a video and using it in court. 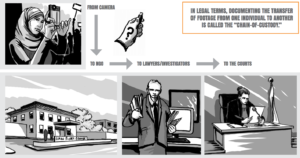 Learn more about how you can document chain of custody in the basic practices section of WITNESS’ Video as Evidence Guide. Surveillance video can be a useful tool for corroborating witness statements and exposing ICE’s tactics, but it can’t secure justice or stop a deportation on it’s own. Remember that surveillance video doesn’t include audio and cameras remain at a fixed point – meaning there could be moments when people go out of frame. Both of these issues leave the footage more vulnerable to interpretation from adversaries, and create space for misinformation and distrust. That’s why verification and ethics are so important when filming or sharing a video (learn more about verifying video here). Work with a trusted lawyer, journalist or advocacy organization in order to understand the limitations of video, and create the most impact. Due to incredible fundraising efforts from Juan’s family and community, he was released on bail after four long weeks at Adelanto Detention Center. Juan remains in limbo as his lawyers wait to hear back from the judge about whether or not he’ll be deported or able to stay in the U.S. with his family. Although Juan is at home with Crystal and Sofia, it’s important to remember there are lasting implications to being in a detention center. Detainees, their families and communities often experience trauma, mental and other health related issues, they might fall behind on rent, lose their jobs, etc. This only further marginalizes working class and people of color. Unfortunately, Juan’s story is similar to cases we’re seeing across the country as ICE arrest rates of undocumented and undocumented immigrants without criminal records skyrocket. In fact, Juan was arrested during a week of similar ICE enforcement actions across the country that targeted hundreds of immigrants in sanctuary cities. WITNESS’ Eyes on ICE series will continue to explore the role video can have in exposing these abuses and advocating for immigrant communities.